To expand on that second point, one thing I have always enjoyed about the entire Suikoden series is its underlying complexity. III is a perfect example, perhaps a notorious one. Your characters are split into three groups of two, of which only one can ever take a meaningful action and the other will always auto-attack. They’re ‘leashed’ to each other, and location matters. Each character (of ~70 playable) has their own unique set of stats, including equipment restrictions and possibly in-built runes and available slots. 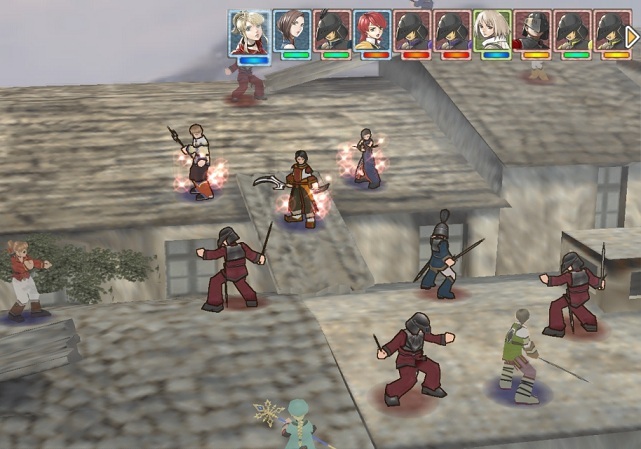 To top it all off, each character also has a set of passive skills they can master – each of which has its own leveling difficulty and mastery ceiling, and some are unique to particular sets of characters. That’s something like 5 layers of complexity over the old-school Dragon Quest mechanics, and they will only ever matter if the player tries to win normally “unwinnable” fights for special rewards. In Suikoden IV, then, Konami backpedaled a bunch and removed layers of complexity. Four characters in combats, no silly groupings, no skills, and fewer runes/stats. No “unwinnable” fights, save exactly one poorly placed treasure chest monster. The game was pretty much bland combat with slightly-less-bland exposition, and was pretty much panned by disappointed fans. You would think that a series much-vaunted for its interesting and consistent atmosphere (if not stellar translation) couldn’t go too badly, right? Unfortunately, Tactics takes a substantial departure from the rest of the series by taking what should be an extremely personal journey for Kyril, and making it feel bland and like it doesn’t even matter. In some games – strategy games in particular are bad about this – there is a scenario where a misunderstanding occurs, and you end up fighting the wrong people for a reason that’s totally irrelevant. 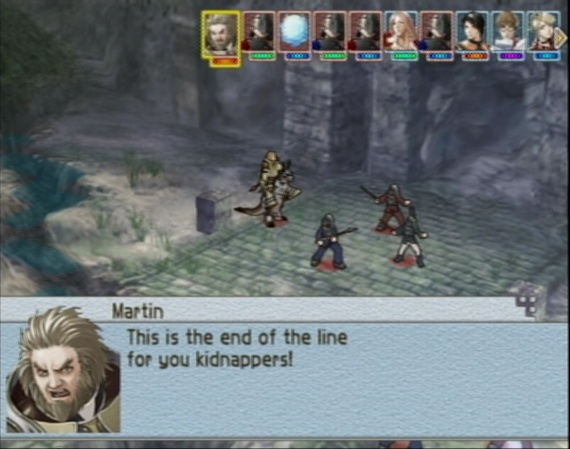 In Suikoden Tactics, this feels like it is happening about 90% of the time (probably only about 60%). By the time your ‘realizes’ who the enemy is, you’re so tired of the dim-witted repartee of everyone involved that it feels empty. Although in name you are investigating Rune Cannons, in fact you end up fighting in a proxy war between various factions of an empire with so little exposition it feels faceless. In the end, Tactics fails plot-wise even at what its most ardent fans claim – that its additional exposition to Suikoden IV is worthwhile or even interesting. There is absolutely nothing new there, aside from some name-dropping of the Scarlet Moon Empire. The ‘alternate effect’ of Rune Cannons had absolutely no mention in Tactics’ predecessor, and Kooluk is an utterly bland, lifeless country.